Basho4Humanity | Tanka Visions of Women ( Praise for Women ) | English collection of Basho's linked verse, tanka, haiku, letters, prose, letters, and spoken word about humanity - with commentaries to enable the ordinary reader to understand and enjoy Basho's words. People who know Basho believe he wrote no tanka (poems in 31 sound-units) because they have never seen one in Japanese or translation, however two Basho tanka appear among works never translated, and these verses provide two of the most feminine of icons to be found in any literature. Also In this article is one more tanka that does not appear in Japanese Basho anthologies, and five “tanka-equivilants,” pairs of successive renku stanzas, the equivilant of tanka, that further reveal Basho’s extraordinary feminine consciousness which has been so ignored through the centuries. The double and triple meanings – layers of kimono, succession of years, of generations; wrinkles in the kimono and in her face -- overlap to form a web of blessing and hope for Kasane and all female children. Kasane, now your time begins, stretching to infinity before unfocused eyes. Soon you’ll be laughing and playing in the sunshine – that is, if no wars come and natural disasters, fatal illness, and financial ruin stay away too. One spring in youth, you shall be given your first blossom-kimono – the one you wear just once a year, for the family and friend blossom viewing picnic. A formal kimono is a two-layer silk robe worn over an under robe, meticulously folded and tucked around the body in flat, even layers. The colors and pattern are chosen in harmony with the woman’s current age. A blossom-kimono for a girl entering womanhood might be a soft pink with bold cherry blossom design on the lower portion. A thick brocade sash of a darker contrasting color encircles her waist. The red inner robe, suitable for a party, shows at the neckline, and where the left side of the skirt covers the right, margins of the kimono lining appear and disappear as she walks. In his few simple words Basho speaks of what concerns women: the succession of life, the happiness of children—the conditions of Peace, both social and family, in which little girls can dress up and party with relatives and friends, and life goes on generation after generation. The poem in five short lines encapsulates the existence of one woman from newborn to old age. It transcends the boundaries of literature to become something greater, an ode to Life. The verse offers Hope to the smallest females—Hope for a childhood without misfortune, hope that she will grow into womanhood and see grandchildren —yet this Message of Hope has been swept under the rug. A few comprehensive Basho anthologies do give the tanka buried among six hundred pages where nobody notices it. Since I found and translated this poem thirty years ago, I have searched through hundreds of books on Japanese literature, both English and Japanese, and found no mention of it. The few scholars who know of the tanka find it trivial, not worth discussing. Women when they know of this verse, may see it differently, recognizing it as the most pro-female and humane work in Japanese literature. This kettle is boiling water for tea. In the first two lines, Basho recalls the tea ceremony Uko performed for her guest. Kon elaborates Basho’s meaning: “as I think of the kettle boiling in your tea cottage, I imagine your peaceful, settled lifestyle” -- a lifestyle so serene that each evening she has the time and heart to make tea in the formal meditative Way of Tea. Like so many Basho verses, the focus in on peace, tranquillity, and warmth – while his praise for the female is as clear as the blue sky. In a house of refinement, the houseguest never puts out his or her own futon and pillow. This is done by the wife of the house while the guest is in the bath. Because Japanese line things up in parallel as an expression of respect, and because Basho was her teacher and a guest in her house, we can be sure that Uko diligently lined the three futons and pillows evenly -- and this lined up regularity in Uko’s placement of the three pillows compares to her gracefulness of her tea ceremony. The three futons are like the three strokes of the Chinese character for ‘river,’ 川, which suggest a baby nestled between mommy and daddy, receiving warmth and security from both sides. In the tanka the heat of “kettle boiling” flows into the warmth in Basho’s memory of “those three pillows.” He wrote numerous haiku praising the splendor of Kyoto’s temples and shrines, as well as yearning for Kyoto long ago, but here Basho praises the living humanity in Kyoto, the serenity of his hostess, the intimacy of theirfriendship. verses into our reality, a completely new image of Basho emerges. major cities in Japan with no sea coast, so poor Uko has no salt water/tears in which to wring out her sleeves. Basho dedicates this nonsense to the “nun Uko” It expresses his affection for her. 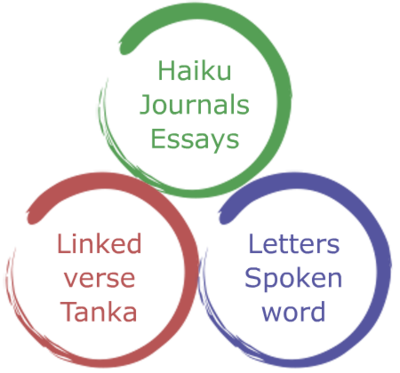 tanka, however it has all the characteristics of a tanka: in Japanese a 5-7-5-7-7 sound patterns; both stanzas by the same poet written in succession; with continuity of both grammar and content. They are not a tanka, but a rose by any other name would smell just as sweet. I call them "tanka-equivilants." Once again Basho expresses emotions through physical actions of specific body parts. Although it is summer, and people expose as much of their skin as possible to the cool breeze, this woman sinks as deeply as possible into her kimono collar as she thinks of her failure to find true love. Not only is this woman disappointed in the failure of gods and Buddhas to fulfil her desires: she no longer believes they listen, or even exist. goddess is a woman at work. 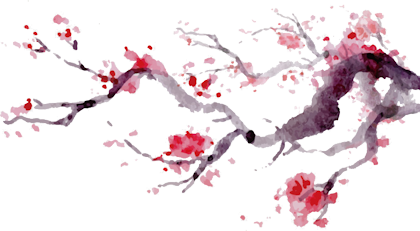 The red flowing away suggests menstrual bleeding, and the combination of red and white evokes the Japanese obsession with these two colors, as in the national flag, red sun rising against pure white sky. 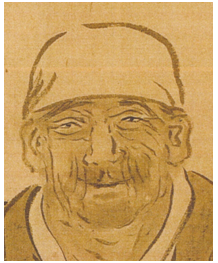 Sato says Basho “painted with words a picture of a Chinese goddess that Utamaro – ukiyoe artist famous for sexual imagery -- might have drawn with a brush” -- yet Basho’s goddess at work can be of any race in any time. His worship of the female transcends all boundaries. The flow of images -- identical in this translation as in the original – make this one of Basho’s most heart-rendering verses. He begins with a single word of speech or thought to open the mind without any context. provides the sad context for the entire scene: tuberculosis. for her daughter, and hears or remembers hearing her cough. Each possibility is equally valid and worthwhile. thus she absent-mindedly uses her tool for strumming strings to scratch her head. Another poet wrote #s 13 and 14, then Basho wrote #15 which I have combined with his #12 to produce this ode to breastfeeding. In Asian cultures, rice is strongly associated with women, fertility, and the nurturing of children and society as well. Traditionally rice was planted by the young women of the village in hope that their fertility would magically transfer to the rice- paddy, a “pond of knee-deep sludge, the consistency of a malted milkshake.” She emerges from fertile mud to nourish her child from her breasts. This young peasant woman’s entire body is soiled and roughened by everyday dirt and mud, with only hard mineral-laden water for washing. Still, she tries to keep her face clean and pretty, for baby to behold. Has any other male poet produced so exquisitely feminine a poem? Feminine in concern for facial beauty and cleanliness, the femininity of women at work, women with breasts, women nourishing life, and women’s hopes for children’s future, all wrapped up in five short lines. The Japanese contains no personal pronouns. You will notice that together with NO LONGER BLACK I translate "her lap" while with ONLY MY FACE I use "my lap" to make the poem a personal communication between the soul of woman and the soul of baby, a prayer that her child will escape the constant work and ever-present grime of village life, an intergenerational message of hope for a brighter and more prosperous future.